Discussion in 'Bug Reports' started by Ken Norris, Apr 3, 2018. I had the app working great for a couple days. After a restart the application would not open, so I downloaded the install file and chose repair. The app opens now and I can successfully pair my iPhone, but the hot keys don't switch to the phone. I have unpaired and repaired several times, not sure how to proceed at this point. Failed to mention that I have changed the keyboard hotkeys several times and that does not have an affect on the error. I'm afraid that you would forget connecting Bluetooth manually like the below picture. 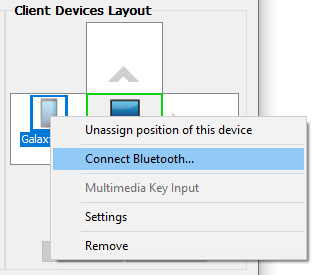 Is Bluetooth connected between PC and iPhone? You can check the status by checking whether the icon is solid (connected) or semi-transparent (not connected). If it's not solid, please try the above manual connection. Once Bluetooth is connected between devices, you are able to switch keyboard input using the hotkey. Hi, yes, it is connected. I show the connection on my phone, and the phone on screen keyboard is not available on the phone as you would expect when you have a connected bluetooth keyboard. I just discovered an additional symptom. The open access center hotkeys don't work either. However, when I have mouse drag enabled I can drag the mouse off screen to activate the phone keyboard and then use ctrl keys to get back to the computer. Unless there is something that you would like for me to test, I am going to completely uninstall the application and re install to see of this corrects the issues. I completely removed and re-installed the app. All working now. Glad to hear that! What version did you install? 1.40? The updated version (v1.40) is now available from our download page. If you can't see the updated version from our download page, please reload the page from your browser. I strongly recommend to update to v1.40 that must be far more stable than previous versions.